Adventure para K-Pop, K-Mom, and K-Kiddie too! KIDS EAT FREE with the #Bonchon Kiddie Adventure Meal! Just buy any 2 boxed meals for P330 to get a FREE Glazed Chicken Poppers with rice and Activity Kit for your kid! 1. Buy any Two (2) Bonchon boxed meal and get a FREE Glazed Chicken Poppers Rice meal and one (1) Activity sheet for your kid (3-12 years old). Crayons may be borrowed from the store. 2. Promo valid for rice boxed meals P165 and above. 3. Promo valid for kids 3-12 years old. Kid must be present to avail of the promo. 4. Only 1 free meal per order is allowed. 5. Promo valid for DINE-IN transactions only. View complete promo mechanics HERE. 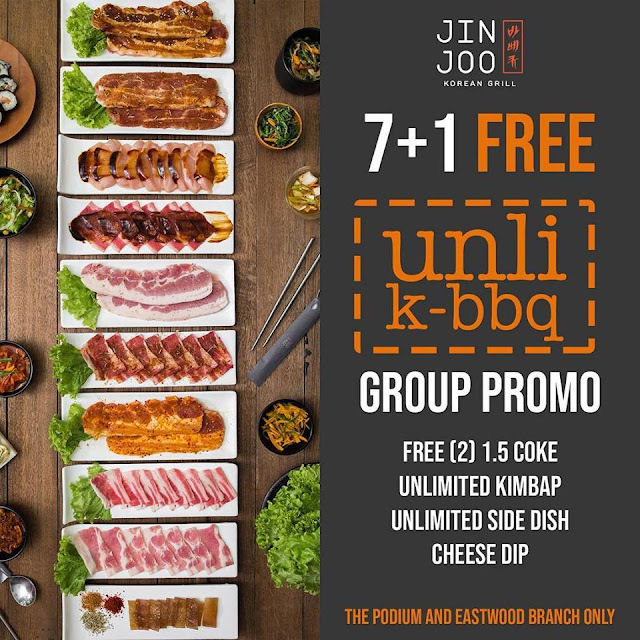 JIN JOO Eastwood & The Podium 7+1 UNLI-KBBQ is here. •Promo is available at Eastwood and The Podium Branches ONLY. •To avail the promo, minimum number of pax is 8. Rate is (7) full paying adults plus (1) adult pax eats for FREE. •Promo can’t be used in conjunction with other promotions and discounts. YUP's Your Unlimited Pork Samgyupsal Weekday Promo for as low as P299, and Unli Pork & Beef for P399...includes unli rice, lettuce, 8 kinds of side dishes, egg and cheese. 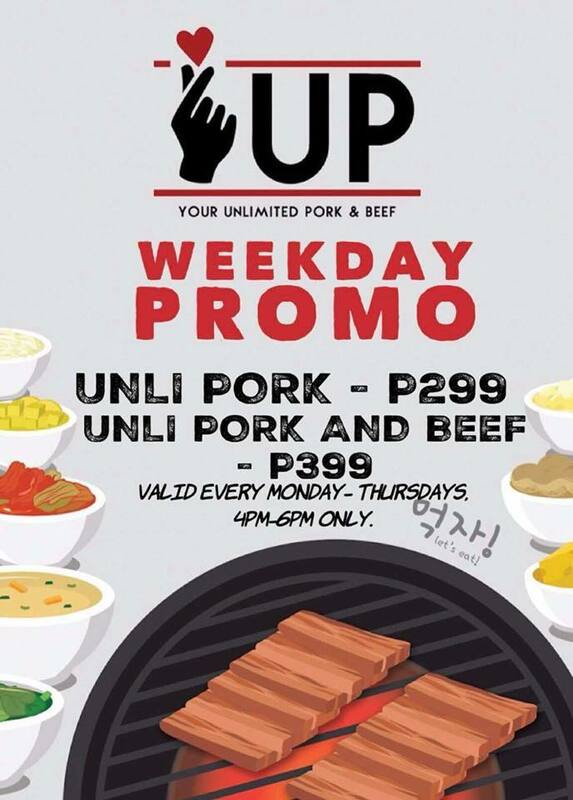 Promo rate is valid every Monday to Thursday from 4pm to 6pm! YUP is located at Brique Plaza Palico 4, Imus Cavite. Opens daily from 4pm to 12am. Promo is not valid during Holidays. Experience a new kind of feast at Blackbeard's Seafood Island Eastwood! 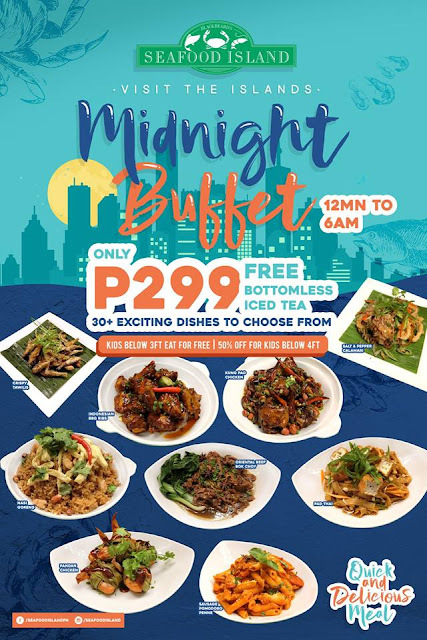 Enjoy a buffet from 30+ exciting dishes for only P299! Available on weekdays from 12MN to 6AM at Eastwood branch only. 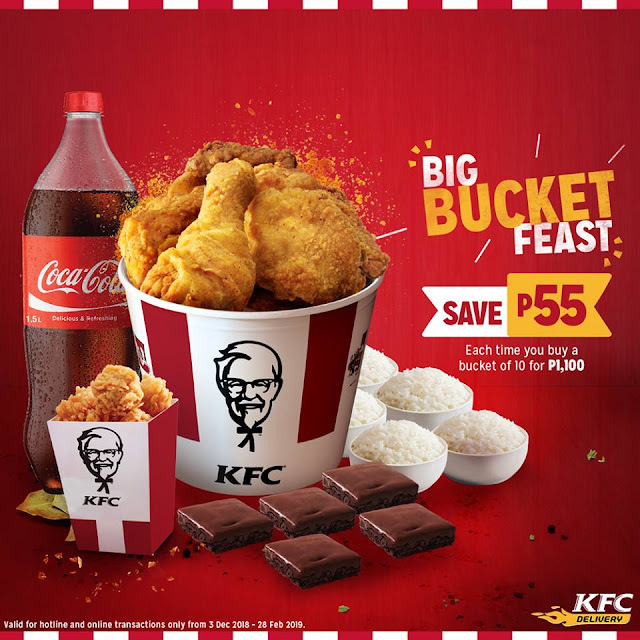 Enjoy a hefty meal to share when you order a KFC Big Bucket Feast! 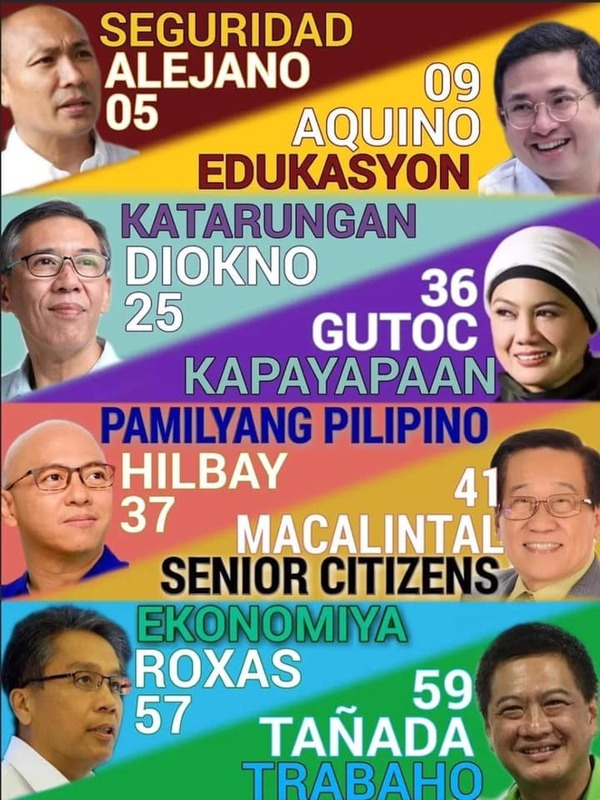 Save P55 until Feb. 28, 2019 only. Valid for hotline and online transactions only. Order online at kfc.com.ph or call 887-888 now! Why not celebrate Christmas season with an Eat-All-You-Can Promo at Century Park Hotel's Century Tsukiji? 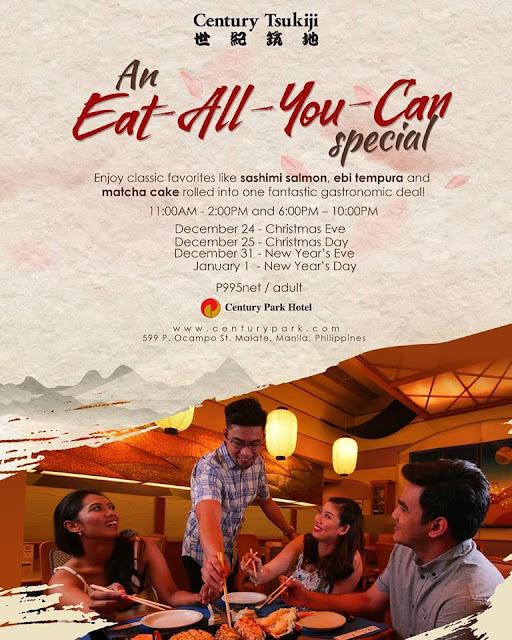 Enjoy classic Japanese favorites such as ebi tempura, salmon sashimi and many more for only P995 net! Valid on Christmas Eve, New Year's Eve, Christmas Day and New Year's Day. Please call Century Park Hotel at +632 588-8888 for inquiries and more info. 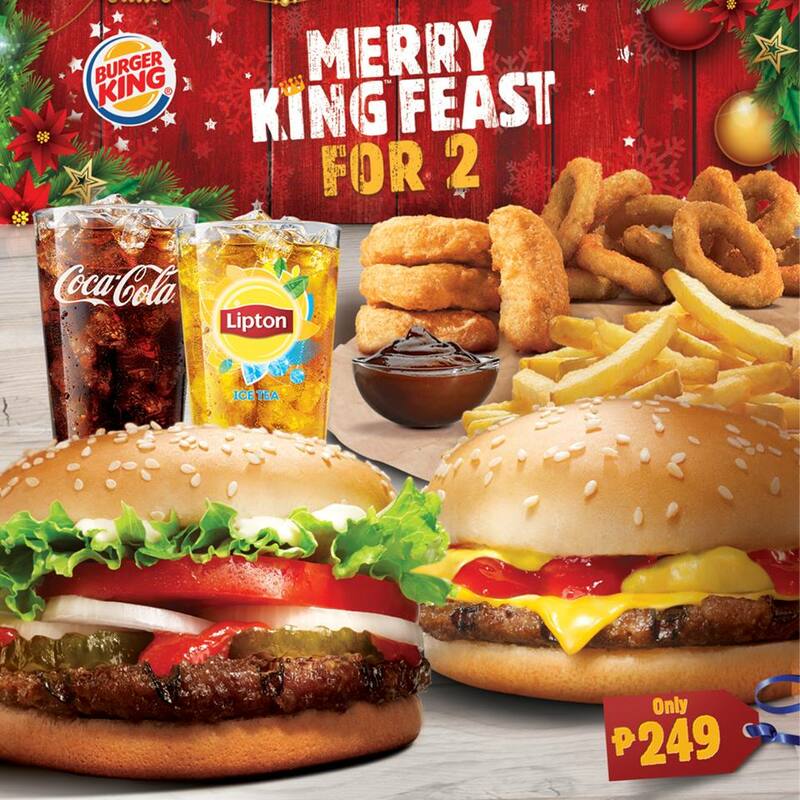 Check out Burger King's Merry King Feast For 2 Promo for only P249, happening until December 31, 2018. Valid in all Burger King branches, except Gateway and airport terminal stores. Valid for dine-in, take-out and drive-thru only. Cannot be used with other types of discount. In the purchase of goods and services which are on promotional discount, Senior Citizens can avail the promotional discount or the discount provided under the Expanded Senior Citizens Act of 2010, whichever is higher. 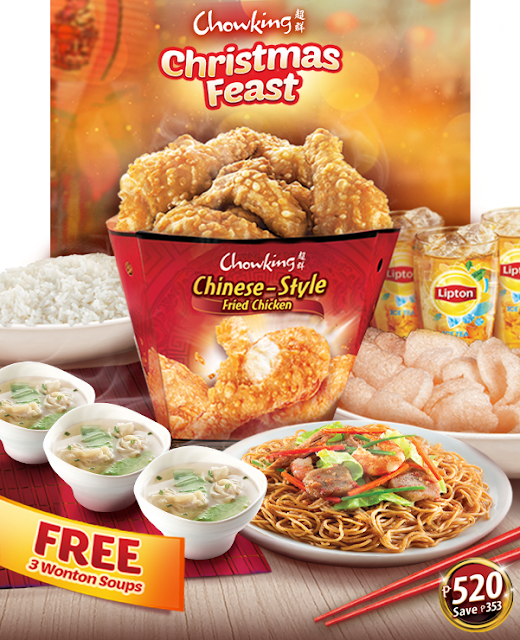 Mas maligaya ang Pasko with Chowking Lauriat! Buy any Lauriat variant with drink and you will get Small SuperSangkap Halo-Halo for only P49 (Save P6)! Promo runs until December 31, 2018. Valid only for dine in and take out transactions only. Not valid in conjunction with other discounts. Check out Shakey's Weekday Pizza Blowout! Get 3 Large Thin Crust Pizzas (1 Pepperoni Crrrunch, 1 Manager's Choice, & 1 Shakey's Special), 7pc Chicken 'n' Mojos with 1.5L Coke for only P1,495*! 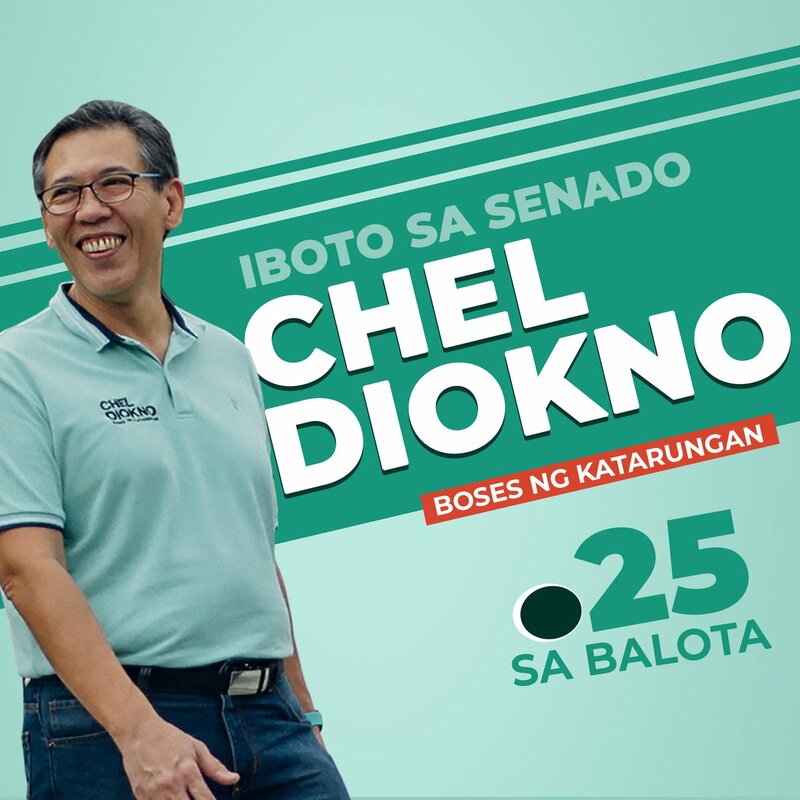 (Save P859)! Order now via Facebook Messenger, call 77-777 or #77-777 (toll-free for Globe & TM), use the Shakey’s mobile app or visit their site HERE. 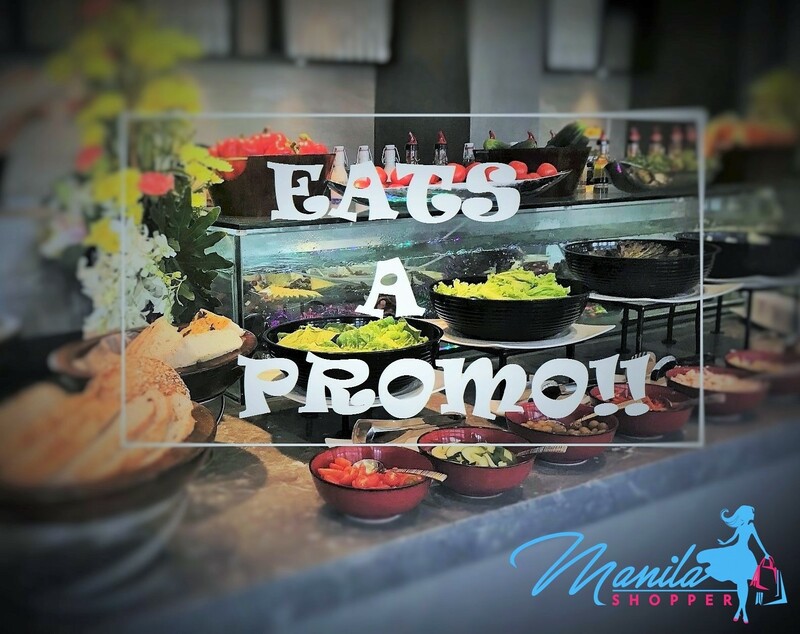 **Promo valid until December 28, 2018. Monday to Friday only. Have a hassle-free Holiday and Order in advance! Check out Pizza Hut's Supreme Hot Deals Promo. 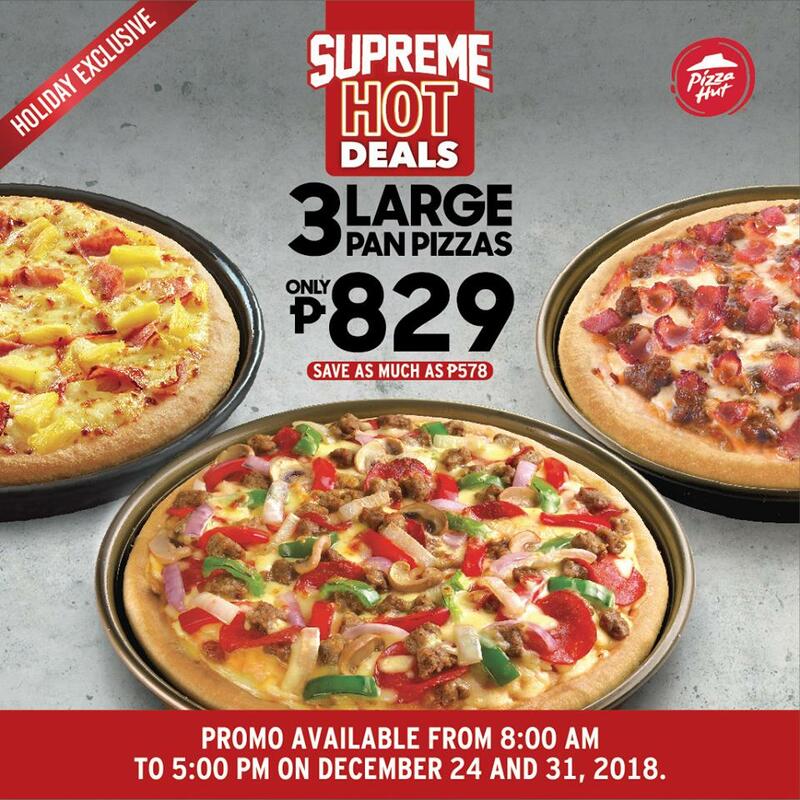 Get 3 Large Pan Pizzas- Hawaiian Supreme, Supreme and Bacon Cheeseburger with our Supreme Hot Deals for only P829. Save as much as P578! Order from 8AM-5PM on December 24 and December 31. Available for delivery only. Visit www.pizzahut.com.ph or call 911-1111. S&R New York Style Pizza is bringing you two delicious Holiday Blowout offers. Offer 1: One whole Made-to-Order Pizza + 10 pc. Chicken Baked Wings + four (4) 22 oz. Iced Tea. Available in any S&R Warehouse (P1,099) and S&R New York Style Pizza Parlor (P1,999) nationwide! Offer 2: One whole Made-to-Order Pizza + 10 pc. Fried Chicken + four (4) 22 oz iced tea. Available in any S&R Warehouse (P1,299) S&R New York Style Pizza Parlors (P1,349) nationwide. Promo period: December 1-31, 2018. 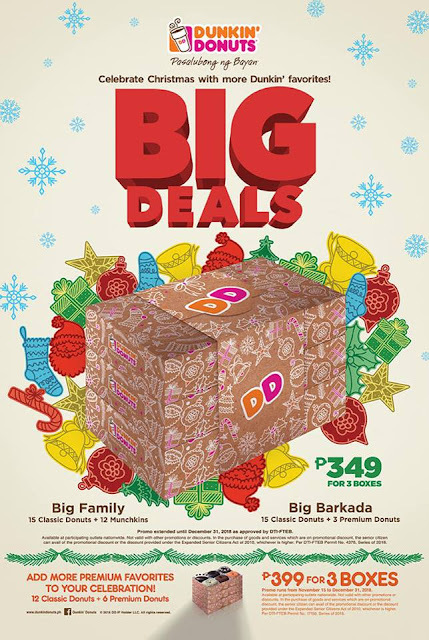 Enjoy Dunkin’ Donuts’ Big Deals over the holiday season! For only P349, you get three boxes of Dunkin’ Donuts treats! Choose from the Big Family Bundle (15 classic donuts + 12 Munchkins) or the Big Barkada Bundle (15 classic donuts + 3 premium donuts) to your next get-together, or have it delivered by logging on HERE or calling 988-7288! 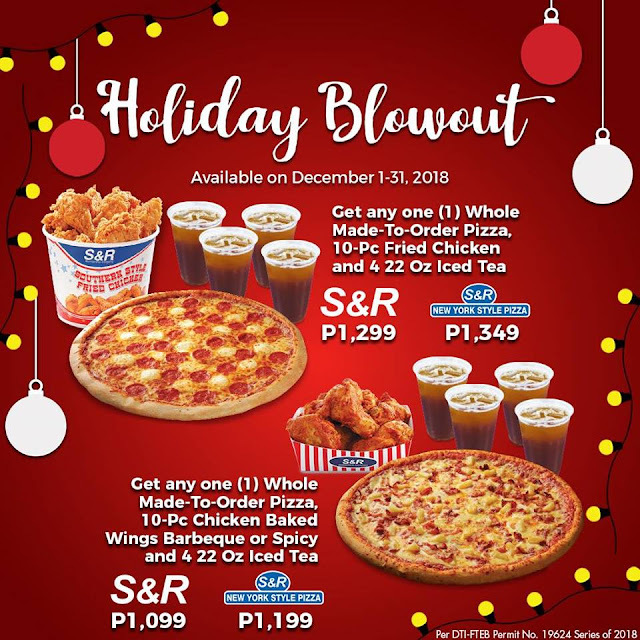 Promo runs until December 31, 2018. Treat yo’self and your loved ones with Krispy Kreme's #HoliGlaze Merry Treats Promo. Buy pre-assorted Mixed Dozen for P299 or Box of 6 Original Glazed® Doughnuts for P149 from December 15-31, 2018! *Each person is only allowed to buy a maximum of 2 sets. *Valid in all Krispy Kreme stores except Makati Medical Center, SM Mall of Asia Arena and Airport stores.